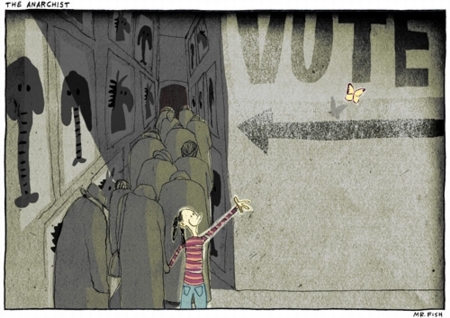 Observations on women and children on voting day: Mr. Fish is one of my favourite cartoonists. His work appears on Robert Sheer's Truthdig website. Here he depicts the grey and huddled masses going off to vote on election day. They have their heads bowed as they walk down a narrow lane covered with the images of the only 2 choices they have - elephants or donkeys. The yong girl whose hand is held by her mother is the only person in colour. She is reaching towards another coloured object, a butterfly, which is moving away from her. It seems Mr. Fish is showing that the hope of the young lies in things other than voting, while the voting adults face a much bleaker and more pointless reality offered by making a choice between two nearly identical parties. He calls it "The Anarchist". The other image is a poster entitled "Election Day" and its purpose is to show the dangers of allowing women to vote. The poster is date stamped 1909 which gives some indication of its historical context. Women in America did not get the vote until 1920 even though some southern hemisphere countries like New Zealand and South Australia got it much earlier (1893 and 1894 respectively). The woman is clearly a "suffragette" who believes women should have the right to vote (see the sign "Votes for Women" on the wall at the top right) and is going off on election day to agitate for the cause. 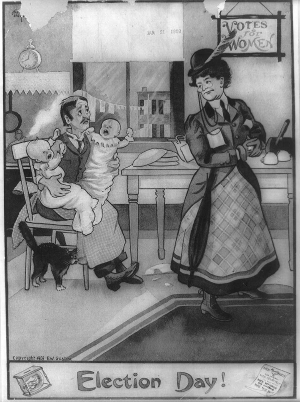 The poster depicts men's opposition to this idea, playing on the fear that if women get the vote they will become so involved in politics that they will neglect their domestic role and leave the care of the children with their clueless husbands (but note that the washing up has been done, if not put away). In the bottom right corner there is a hard to read letter with the disparaging title "Hen Party" and the names of women such as "Mrs. Henry Peck". Both the young girl and the suffragette seem happy and hopeful but for very different reasons.